Why Guest New Zealand holiday planning? Home Travel Information Why Guest New Zealand holiday planning? There are many key benefits and reasons to involve Guest NZ with your New Zealand holiday planning, we’ve listed some of the key questions travellers ask us when planning a holiday itinerary. For any additional questions please phone or email us and we’ll reply quickly. WHY USE GUEST NEW ZEALAND FOR YOUR HOLIDAY PLANS? You'll get an authentic New Zealand holiday designed by a New Zealand travel expert, plus a customised travel itinerary. We'll include stylish boutique accommodation (e.g. lodges, cottages and small hotels) and small-group tours. By using our local knowledge, you’ll get the correct travel times and distances between locations. You’ll stay in beautiful locations and find those hidden gems! HOW MUCH WILL IT COST ME TO USE YOUR SERVICE? Some people believe that booking a trip through a travel agent will cost them more. This is not correct. We have excellent contract rates with our suppliers, so the cost to you is exactly the same. Any unforeseen hitches during your trip? - we'll sort them out immediately! It's the full service. You’ll get a detailed itinerary, all your travel bookings secured and a travel app with your travel details already loaded. CAN I PLAN A BETTER TRIP MYSELF USING THE INTERNET? Guest New Zealand is a listed travel service by Tourism New Zealand. Unlike anonymous travel websites, we stand by our recommendations. We're the boutique travel specialists and we know the products we recommend from first-hand experience. You'll get full access to the latest travel technology pre-loaded for your convenience. Using e-mail, skype and phone, a New Zealand-based travel consultant will provide a written confirmation of all bookings. Payment is requested 30 days before travel. Once payment is made, you'll receive a beautiful detailed itinerary - either online, as a PDF or by travel app. We accept payment by credit card or Paypal. A service charge of two percent is applicable on both options. But we recommend a bank transfer with no service charge applying. Generally, bank transfers are the best way for larger overseas payments to avoid exchange rate conversation fees. WILL I BE ASKED TO SECURE MY BOOKING WITH A DEPOSIT? We are a small company committed to personalized service. Creating and coordinating an itinerary for each Guest takes a significant amount of time. We do require a deposit of NZ$50 to NZ$150 (depending on the effort we have invested on your behalf). Note, this deposit is fully credited back to your reservation file, so there are no additional charges to you. CAN'T YOU JUST INITIALLY PROVIDE FREE TRAVEL INFORMATION? We're a small company providing a personalized service and cannot function purely as an Information Centre. After a few initial conversations (by email, phone or skype) you'll receive a deposit request which can be paid via PayPal ( major credit cards also accepted). We will not charge any credit card service fees in this instance. We'll certainly work to your budget to get the best value. Often we come up with alternative accommodation, transport or tour service options/ideas, which will save you money and make your travel far more enjoyable. This especially applies to the smaller, less known tourism providers who can sometimes offer a much better 'deal' than the more well known options. We remain fully independent and impartial. 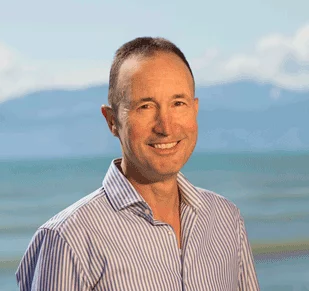 HOW DOES GUEST NZ CHOOSE THE OPERATORS/ACCOMMODATION THEY'RE RECOMMENDING? We personally visit and review each property and operator we recommend. That way, we develop good relationships with our suppliers. This ensures our customers experience the style and facilities of their choice. You'll enjoy unique locations, stylish interiors, great food and charming hosts. Similarly for tours and activities, we recommend those with knowledgeable and friendly guides and only those with a proven safety record. If we consider some properties are not suitable for our own friends and families, then they're not good enough for you, our customer! WHAT IS INCLUDED IN THE PRICES YOU QUOTE? We try to ensure your itinerary is as cost inclusive as possible. Your travel itinerary won't be overloaded with tours and trip, but you will have enough time to decide at location if there are additional activities you wish to do. All prices for accommodation are net per room unless otherwise stated. All prices include Goods and Services Tax and are quoted in New Zealand dollars. Guest NZ specializes in domestic travel within New Zealand, including domestic flights (e.g. our involvement starts with your airport transfer to the first accommodation). We can book International flights between Australia, New Zealand and the Pacific Islands. Travellers from outside these countries need to arrange their own flights to and from their home country. We made it back yesterday and all want to say a huge thank you to you for organizing such a totally fantastic vacation. Once we made it to NZ, every single detail went without a hitch, and the directions you gave us made everything super easy. We felt that we had a great selection of things to do and see, but never felt over-scheduled or pressed for time. And of course we had lots of time to be wowed by the people, food and scenery of New Zealand. I think I told you that I've put a ton of posts and photos on my Facebook page, and mentioned how you had helped us out too; you're welcome to check out the posts, and I've already been talking with friends who are also thinking of visiting NZ so that they know to book through you. We're already talking about returning in the future, maybe in a couple of years when the kids can take part in more adventurous activities. We will be sure to give you a call! Many thanks again for an amazing experience. Michael was such a pleasure to work with while planning a holiday in New Zealand. He was quick to respond to any questions and even available to speak over Skype. All of the accommodations, excursions, and bookings were fantastic, along with his recommendations on what to do in each city. 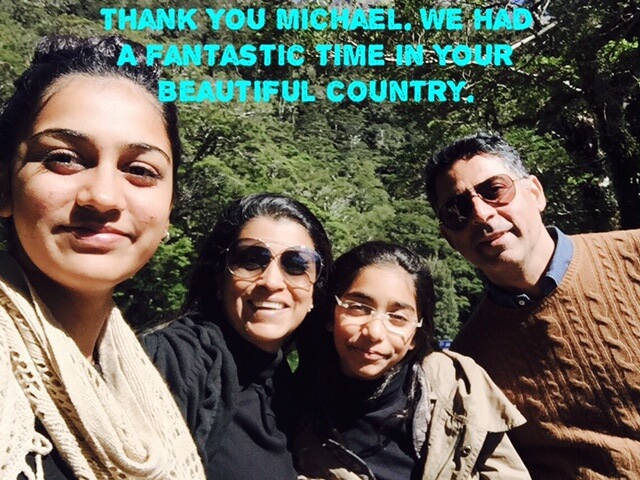 With Michael's help, we were able to see the entire country with our limited time there. The holiday planned by Michael was truly an amazing experience and one I will remember for the rest of my life. Sitting at the airport in Christchurch and reminiscing our last two weeks. It wouldn't have been possible without all your help and effort is planning a perfect holiday. From the best adventures to the best accommodation. We had a fantastic time and would like to thank you for everything. Your country is indeed beautiful. As I would label it. Gods own country. Thank you so so much again Michael and I would referring you to a whole load of friends who have New Zealand on their plans.